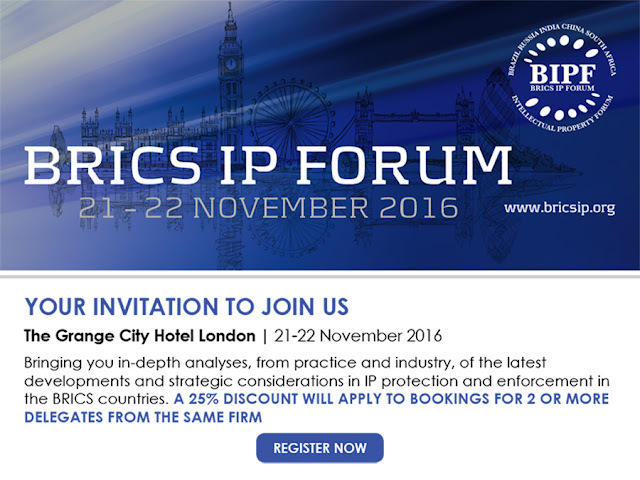 This blogger is involved in a unique IP Forum dedicated IP issues in BRICS countries to be held in London next Monday and Tuesday (21-22 November 2016) at the Grange City Hotel. It is a jointly hosted conference by five well known IP firms dedicated to each country and region plus industry speakers from AB InBev, BSA The Software Alliance, Brand Finance, Novartis and Richemont. There are a few seats still left. The cost of this two-day conference is US$550 pp. This includes the two-day conference, mid-morning refreshments, lunch and afternoon refreshments. The organisers have offered a 10% discount for readers of this blog, please just mention this when booking. Click here to register and send an email here to obtain the special rate.